Home Education Technology Light Emitting Diode - How LED Work? Light Emitting Diode - How LED Work? A new type of device for lighting spreads over the planet, the LED. It isn't really a new device some way or another it has been used for decades all around the world. What is new, however, is having achieved greater emission power than a few years ago and also making it provide white light. Its advantages that it uses up less energy than traditional incandescent lamps. A traditional lamp needs to be heated to emit light and a great deal of energy is wasted in the form of heat. Moreover, the materials suffer at very high temperatures. Recently several types of energy-saving lamps have become popular. The first energy saving lamps that replaced incandescent ones are fluorescents which contain gases inside. On the other hand, LEDs are fully made up of solid elements and can be made very small. In addition, LEDs can be controlled allowing new applications such as the generation of any visible light spectrum on demand, optimizing energy costs and information transmission, this is known as smart lighting. Originally the word LED stood for Light Emitting Diode. Currently, it is used as the acronym for the light emitting device. Primarily, the basic structure of an LED was a PN Junction formed by specific semiconductor materials. The PN Junction is a structure that under certain conditions can spatially separate electrons and holes. By forward biasing, the device which consists in applying a higher voltage in the P than in the end material the current flows through the structure causing the electrons and holes to meet in the same region of the space, this process is known as Carrier Injection. Related Article: How Does Touchscreen Work? How Does OLED Work? When there are many electrons and holes in the same region of space more than those corresponding to their equilibrium values, carrier recombination is enhanced and energy is emitted in semiconductors. Free electrons always have higher energies than those electrons forming the bonds between atoms. The range of energy values that free electrons have is called conduction band and the energy values that bound electrons have is called a valence band. Since the holes are the absence of an electron in the atomic bonds, holes have energies corresponding to the valence band. There can be no electrons in the semiconductor with energies between both bands, therefore this interval is called band gap. When a free electron recombines with a hole in the valence band, the free electron ends up occupying a bond in the structure filling the empty space in the bond. In this process, the electron releases energy as heat or as electromagnetic radiation. To make recombination more effective the PN Junction is replaced by a hetero structure. An active zone composed of several thin layers of materials having different band gap width is embedded in it. The band gap width in some layers is lower than in the surroundings. Electrons tend to occupy the lower energy levels available in these layers, therefore that region becomes a kind of well for electrons because they have lower energies in it than in the surroundings. Once they are inside it is relatively unlikely to escape because they would need extra energy for that. Holes considered as the absence of electrons behave in the opposite way. This structure brings electrons and holes to the same region of space allowing an increase in the probability or rates of radiative recombination. The intermediate region is designed to be very narrow to obtain a high concentration of electrons and holes therein. Since in this situation the device would emit more radiation. Thus the LEDs achieve greater energy efficiency given that the major part of the electric energy supplied is converted into light. Moreover, the energies of the emitted photons can be selected by choosing the appropriate materials for the intermediate region. Photons can have a wide range of energy values and there is an energy interval in which photons are perceptible to the human eye this radiation is known as visible light. The colors we see are due to the different photon energies. Lowest energy visible photons are red and the highest energy visible photons are violet. The breakthrough in lighting technology has been getting materials to emit blue light efficiently. The controlled emission of red and green light was possible before but with lower efficiencies. Currently, the majority of the LEDs used in lighting are based on a blue LED coated with a fluorescent substance. This absorbs some of the blue light and re-emits it with longer wavelengths. The mixture of photons leaving the device is white light which may have a bluish or yellowish hue if higher or lower energy photons dominate respectively. This depends on the well-known device color temperature. 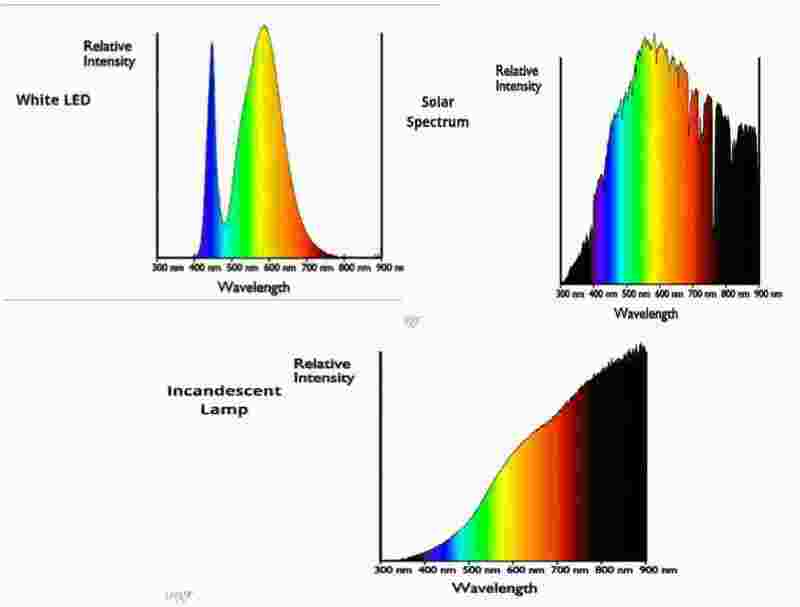 This is the spectrum obtained for a white LED and we can compare it with the spectrum of sunlight. A large proportion of the spectrum that provides an incandescent lamp which has physical mechanisms different from the LED is in the infrared. 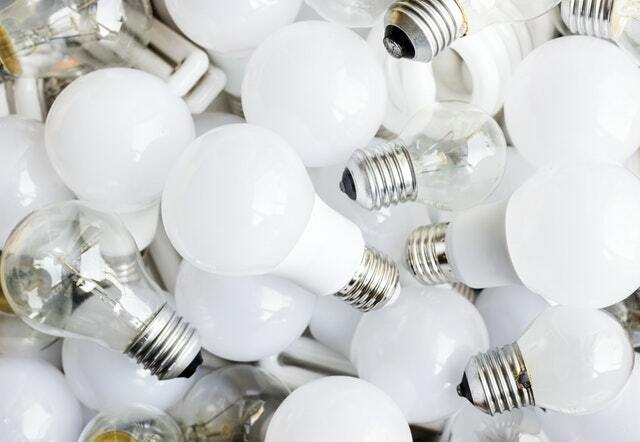 As a result, the incandescent lamp radiates a great deal in an energy range that is not useful for lighting and therefore it becomes very hot, consequently, its efficiency is much lower. A new variant in the design of these devices is the use of organic materials characterized by low manufacturing costs, flexibility and the possibility of obtaining large surfaces of LEDs they are called OLED which means Organic LED. The progress on LEDs is continuous then major innovations are expected in the lighting technology in the following years.